Architect Lorcan O’Herlihy designed the Shermans’ Mill Valley, California, home on top of an existing foundation that was intended for an 8,600-square-foot McMansion, but left abandoned for ten years. The Shermans’ living room is outfitted with Ligne Roset Smala sofas by Pascal Mourgue and a Kenga rug by Angela Adams. The master bedroom interior is finished with cherry wood. The Shermans’ home is designed to blend effortlessly with the hillside on which it rests by using a muted material palette of troweled plaster and cedar planking. At the time, the couple’s house hunt seemed doomed to fail anyway, and they paused to reconsider their situation. 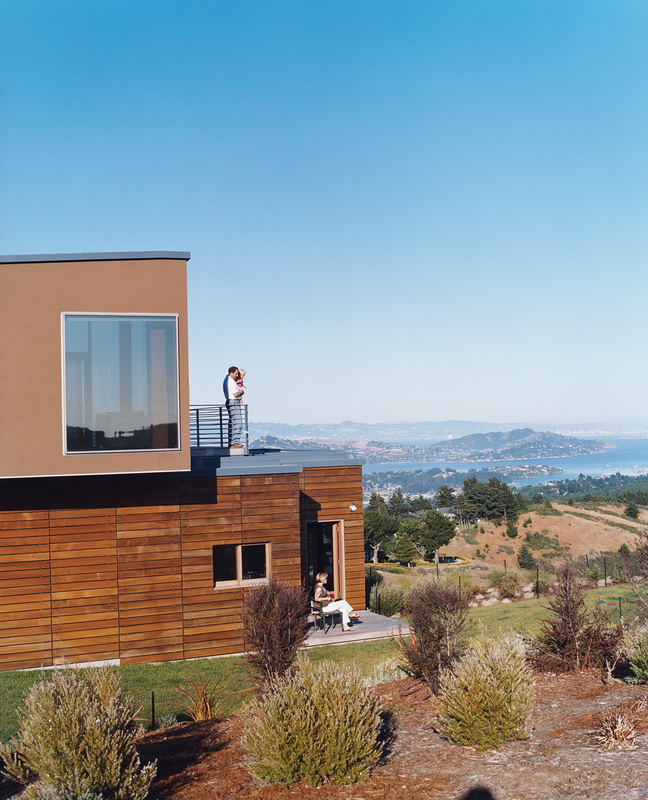 In 2001, recently married and living in San Francisco, Tony and Rachel had decided they wanted to buy a modern house. Because they like to hike and ride mountain bikes, their search led to leafy, hilly Mill Valley, a 20-minute drive north across the Golden Gate Bridge. But this genteel Marin County enclave is steeped in a rootsy tradition that wasn’t necessarily hospitable to modern design. The Arts and Crafts style seemed to hold pride of place. “We wanted to buy something modern,” Rachel says, “and we just weren’t finding anything.” So they took a deep breath and sprung for the concrete colossus. The Shermans then began searching for an architect in sync with their unusual dilemma: how to build a light, modern house of 4,000 square feet on a platform meant for a house more than twice that size. Fortuitously, they happened to read about Lorcan O’Herlihy. The Los Angeles architect had just completed a svelte, airy house on a hefty hillside foundation decreed by L.A.’s tough new earthquake code requirements. O’Herlihy also seemed to appreciate the warm side of modernism, which the couple preferred. “We called him right away, and he came up to see us the next week,” Tony says. Like a natural outcropping, the house follows the folding, bending contours of the hill. Its 4,000 square feet are stacked on two levels resembling long angled bars, with the upper layer offset to one side and cantilevered over the precipitous hill toward the view. The lower volume is wrapped in a floating cedar skin and the top is covered in smooth troweled plaster, mimicking the hillside in color and texture (at least in summer) as well as form. O’Herlihy’s strategy was a success: The board approved the house without a single dissenting vote.